When I looked at my last post I was rather surprised to see it was March - and here we are in May. I haven't been inactive, however, one project has needed to be a secret until it was given away. I have a friend who had a special '0' birthday (not saying what number goes in front of the '0', I'm in awe of her). I enlisted her family and colleagues as well as women who share our patchworking enthusiasm. 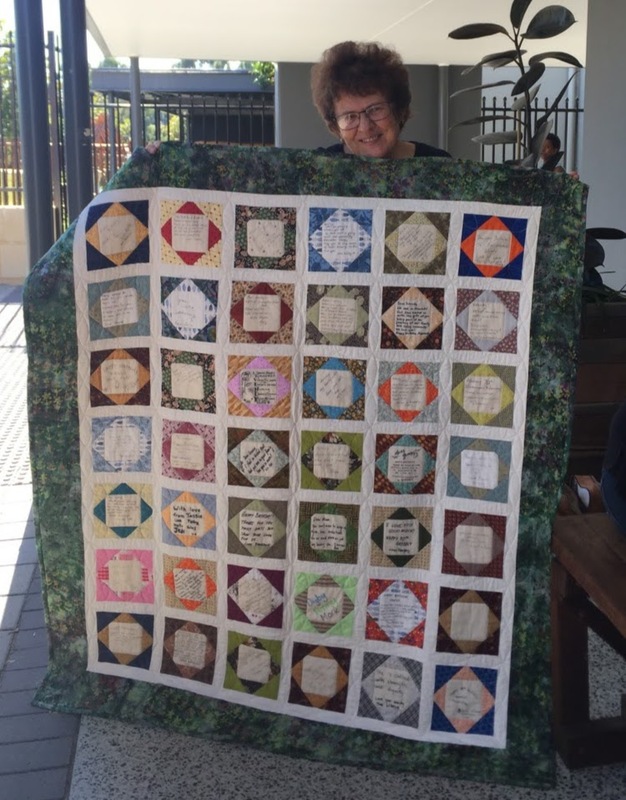 Many people contributed their lovely words, some the blocks and one wonderful friend helped me to piece the quilt. I then quilted a loopy flower in the sashings and into the border. She seemed to like it. The square within a square, or exploding square blocks were 4" for the centre, then the first square placed right side together on top of the centre, also 4", sewn around the edge with a quarter inch seam (then cut diagonally).The third square 5", again sewn right sides together with the newly created 5" square, which then once cut diagonally, opens up to around 6 and 1/2". 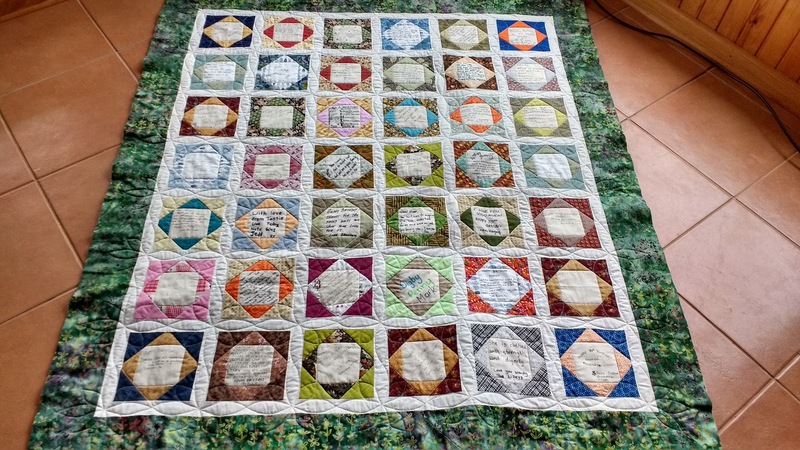 While I had originally suggested to people that our friend might like greens and browns, some contributors understandably wanted to put their own personality into their blocks. For the assembly though, this led to some challenges of how to best place the orange and pink blocks! At least the whole seems to work. 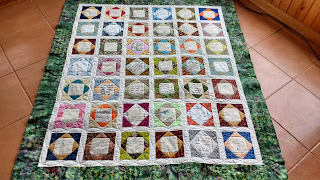 The final border which is a green based batik fabric, seems to help all the blocks play together nicely. 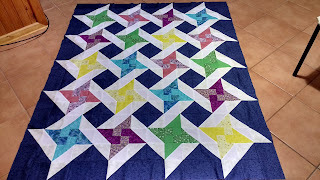 This indoor shot shows the blocks a little more clearly, as well as the quilting. This will be a fund-raiser quilt for my mother-in-law. She asked whether I could make a quilt that her Weightwatchers group might raffle. She gave me several months notice which was good of her - I still have 5 months to quilt it, so that's plenty of time. 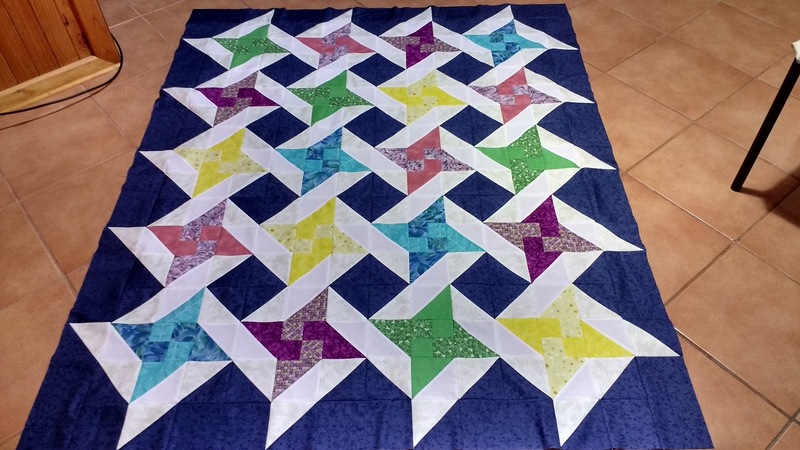 This design was one I saw on Pinterest and made my own measurements, based on the thought that the centre square would be 2 and 1/2". The best part is, I had all this fabric in my stash. Most of the centres or stars, I think I've had those bits of fabric for years. The navy I bought sometime earlier this year and it looked so versatile I bought quite a chunk of it at the time. And its proven to be useful at least twice so far - a real win. I really enjoy making half square triangles from 7" squares right sides together, sewn around the edge, then cut diagonally to create 4 half square triangles. I trim the squares back to 4 and 1/2" and then the blocks go together quite easily. So, another project to add to the list of those not yet completed. Something must happen as we approach the middle of the year that makes these UFOs multiply it seems to me. The challenge is NOT to begin new projects - how hard that is! I do hope to post a completed project soon, but with family visiting from overseas for such a short time, sewing has not had much of a look in recently. Both quilts are lovely! I really like your version of the Friendship Star. 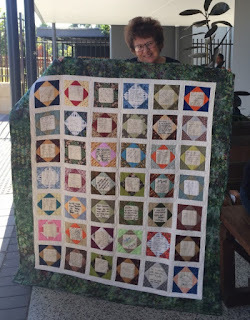 Your friend's "0" birthday quilt is gorgeous! I'm sure she will love it. And I really like how bright and cheerful the friendship star block quilt is. Very fun! Very pretty! I really like your friend's birthday quilt, having all those signed squares is so touching! Oh man, Lynn, you are right on in your words that the challenge is NOT to start new projects... I LOVE the stars one you figured out on your own off Pinterest...might have to do one of my own as I have a good chunk of navy I snagged at a great price a few years ago. I've never seen a quilt like that, very sharp. As for the one for your _0 friend, WOW! You did a terrific job of arranging the 'rogue' orange and pink blocks as it looks fabulous and I hadn't even thought anything was 'off' (which it sure isn't) until you wrote about the greens/browns and then getting some of those with personality, ha. Wonderful gift.